Playing StarCraft II multiplayer can be a bit of a mental strain for me. I don’t think I’m up to the challenge of sitting down and laddering non-stop for hours. I end up getting absurdly frustrated and the more I play, the worse I preform. Even 3v3 and 4v4 games can be pretty exhausting for me (the fact that my laptop can’t handle 4s anymore doesn’t help either). There’s days I want to play StarCraft without really playing StarCraft, which is why I turn to the “Arcade” section of StarCraft. The Arcade section is full of games created by players from around the globe who’ve messed around with the map editor to create some really spectacular things. One of my favorite games in the whole world is StarJeweled. 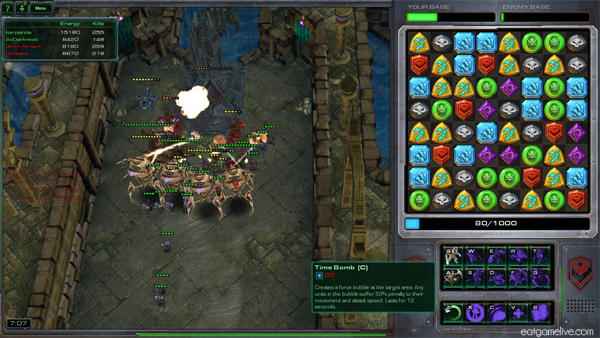 It combines my love of StarCraft and my unhealthy addiction to match-3 puzzle games. In StarJeweled, you earn energy by matching 3 or more of the same jewels. Energy can be spent on building units or using skills. One of the skills that can be used is everybody’s favorite AoE High Templar skill, Psionic Storm. In StarJeweled, Psionic Storm is pretty helpful in destroying the continual onslaught marines coming to destroy your lovely base. Though I am not a Protoss player, I can still enjoy the lovely destruction caused by dropping a big ol’ Psi storm on a flock of marines. I assume that a Psi storm leaves quite a sting, similar to eating a bunch of horseradish on a lamb burger! Ok, a well place Psi storm will be a bit more painful than eating horseradish-covered lamb burger… But at least this lamb burger with horseradish tzatziki is delicious! Total prep time is about 25 minutes. Total cook time is about 15 minutes. This makes 4 servings. Slice 3/4 of your cucumber; reserve remaining cucumber for Tzatziki sauce. 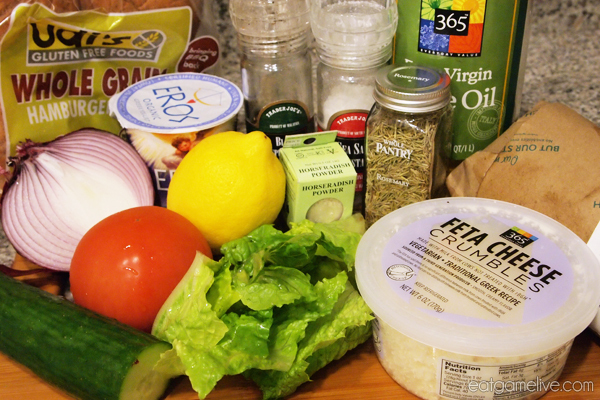 Add cucumber, 1 teaspoon of olive oil, 1 teaspoon of feta cheese, salt, and pepper into a food processor. Process ingredients and remove from food processor. Fold in your Greek yogurt and sprinkle in dill. Combine the ground lamb, rosemary, salt and pepper. Mix thoroughly. Form ground lamb into patties, making sure to remove most of the air from the patties. Add the remaining 2 teaspoons of olive oil to a hot pan. Add in your patties when the pan becomes hot. Cook burgers for about 5-6 minutes on each side, or until the meat begins to bleed (juice will begin to seep out from the burgers). When burgers are finished, remove from heat. 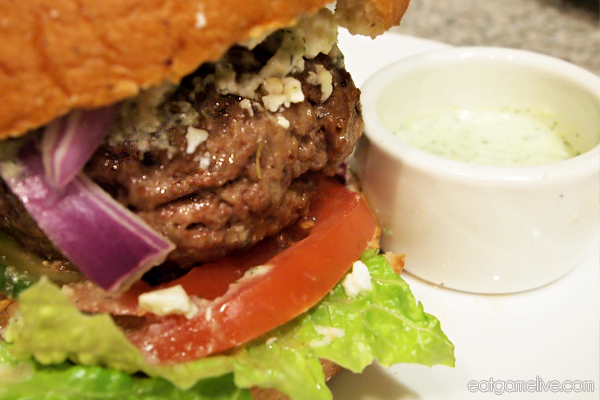 Spread the tzatziki sauce onto the whole wheat buns and begin building your burger: place the lettuce and cucumber on the bottom half of the bun, followed by the tomato and then the lamb patty. 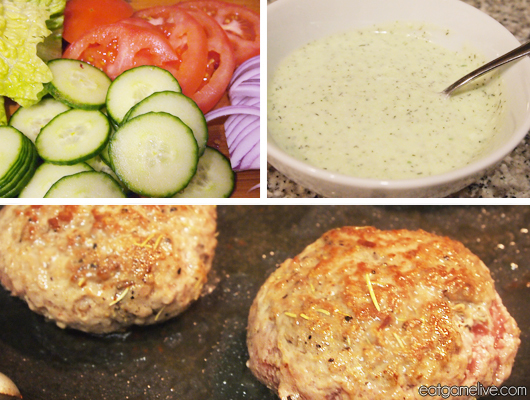 Generously coat the lamb patty with your tzatziki sauce. Place your onions and feta cheese over the lamb patty. And that’s GG WP. Now if you’ll excuse me, I gotta get back to matching jewels to destroy my enemies.